With the arrival of summer time weather, vacations are planned, trips taken, and yearly family reunions are held. Relatives sometimes travel great distances to attend these family gatherings. Just recently, descendants of the Polly White family got together at Berkline park for a reunion. Among approximately 80 people in attendance that day was someone who had been to Overton County only once before, and that was in 1941. Sixty-three years had passed since Audie White Blackshear, daughter of Benton McMillian White, had set foot on Overton County soil. 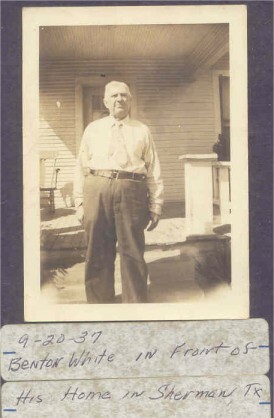 Audie grew up in Sherman, Texas. 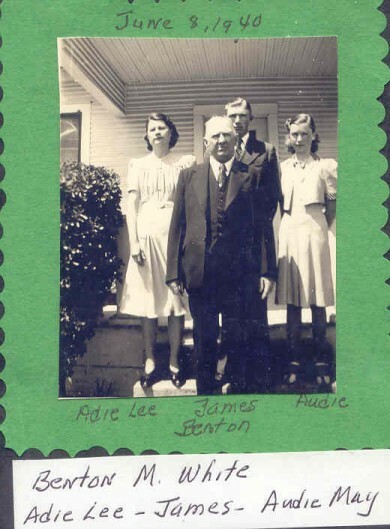 Her mother, Myrtle, passed away three weeks after the birth of Audie’s sister, Jane Ann, leaving her father to raise four other children all by himself. His brother and sister-in-law, Sidney George White and wife Mary White, offered to take the infant daughter, Jane Ann, into their home to raise in order to help Benton with the overwhelming task of caring for his children after his wife died. Audie was only 5-1/2 years old when her mother died. In spite of not having a mother to care for the family, Audie believes her dad did the best job he could to provide for the family, and did an excellent job teaching his children how to survive during the time the depression was going on. One of the ways he provided an income for his family was to begin a dairy business. He bought a few head of milk cows and fenced in part of their back yard. After the milking was done each day, it was poured over a cooling system which the children helped with. After the milk had cooled, it was bottled in pint and quart bottles, a paper lid placed on top, and in just an hour’s time after being milked from the cows, bottles were delivered all over the town of Sherman and placed on the doorsteps of their many customers. As time went on, the dairy business grew, and an additional lot near the White home was purchased for the construction of a dairy barn. The White family also raised a big garden every year. 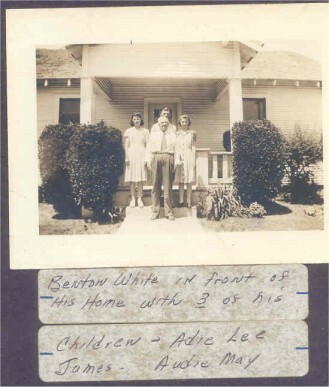 In 1941, Benton White decided to come to Overton County for a month long visit, and asked Audie if she would like to accompany him on this trip. She was very happy to accept his invitation, and in May of that year, the two of them journeyed from Texas to Tennessee by way of bus. Audie told me that she had always kept in close contact by writing letters to her father’s sister, Leeann White French, and her dad’s brother, Andrew White. The three of them corresponded quite regularly. Her father’s great-niece, Ola Mae White Franklin, was someone else she corresponded with often. Other relatives Audie and her father visited with being Ermin White, a nephew, and his wife, Vella. Ermin and Vella had a toddler by the name of Kuell at the time of this visit. During the visit to Ermin and Vella’s home, Ermin hitched up the wagon and mules for a ride to Audie’s Aunt Ann’s home (Leeann French). Audie remembers how rough the ride was over rocky roads as they journeyed to the French home. A family gathering was also held during the 1941 visit at the White cemetery that’s located not too far from the Independence community of Overton County. She told me how happy her father was to be back in Overton County for this visit, but he never made any plans to return again after that trip. Audie now lives near Fort Worth, Texas, and is in remarkable health to be going on 82 years old. No one would believe by looking at her that she’s that age. Her family includes two sons and three step children. Her husband, Charlie Blackshear, is deceased. Her older son is Robert Lee Blackshear, and the younger one, Benton Kuell Blackshear. The younger one was named for his grandfather, Benton, and for the toddler relative Audie remembers as being such a sweet little boy, Kuell White. Her visit this year also included time spent with Kuell and his wife, Carolyn. 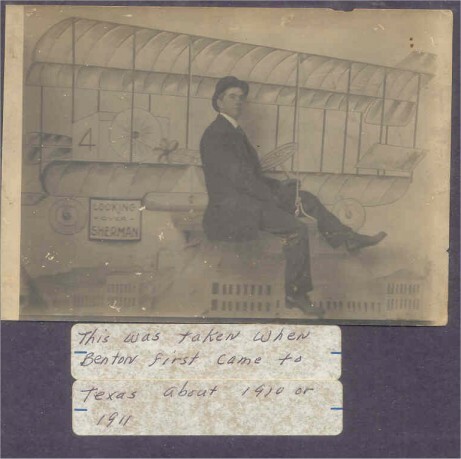 In addition to attending the White family reunion, Audie, who was accompanied on this trip by her niece, Mary Graham, and great-niece, Donna Parker, have used some time spent in Livingston to do additional genealogy research. Genealogy is something Audie has spent many years doing, and has complied quite a large amount of historical information. The nieces in turn have become involved in this research as well. The three are making plans for a journey to Virginia to continue their research into the White family beginnings. Salt Lake City is another place they have on their list of future trips. Audie invites anyone who has information about the John Dillard White family to feel free to contact her at her address - 6304 Millwood Court, Arlington, Texas 76016. Her phone number is 817/654-2702. I asked her about the changes she could see that have taken place in Overton County since her first trip here, to which she replied that this is such a beautiful part of the country. She remembers the Livingston area as not very populated when she was here in 1941, with hardly any brick homes at all. She is happy to have had the opportunity to return one more time to the area where her father grew up, and to once again connect with family members she visited who were just children some 63 years ago. Meeting second cousins she had never seen before at this year’s White Reunion is another thing she is happy to have been able to do. She feels sure her second visit to Overton County has brought smiles to the faces of those members of her family who are looking down on her from above.